A functiondecoder is like a locomotive decoder without a motor supply. It is used to switch the interior lighting of wagons and the front- and backlights of engineer’s cab wagons. 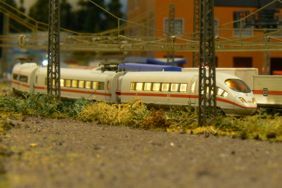 Putting an analog wagon with interior lighting into a digital system, the light will permanently be on and, due to the higher track voltage, it lights brighter than in analog mode. Furthermore, because the digital track voltage is alternating, the front- and backlights of engineer’s cab wagons will both light at the same time. Beware! In both cases, the bulbs or LEDs might get damaged! The solution for this problem is a function decoder. According to the locomotive decoders, it is necessary to develop an own decoder for each wagon type. And also according to the locomotive decoders it is as easy to install the decoder into a wagon. One complete ICE set consists of two locomotive decoders for the two traction units and two lightboards, which are switched by the decoder in one of the traction units via the couplers. With this solution, no more function- decoders are needed. For further wagons, the set can be expanded by additional lightboards. All in all, we developed four different types of decoders for the ICE3. One for each end wagon, one for the wagons in between and one for the motor unit inside the on-board restaurant wagon. For further wagons in between, the set easily can be expanded by additional functiondecoderboards. Here a function decoder inside the engineer’s cab wagon switches the front- and backlight and also the interior light of the wagons. These wagons contain lightboards which are supplied and switched by the fuction decoder in the engineer’s cab wagon via small connectors. Actually, the functiondecoders are revised to the newest state of the art like the multiprotocol locomotive decoders. Furthermore, we will develop functiondecoders for the different driver’s cab coaches , e.g. local passenger train, Inter-City, SBB (Swiss), doubledeck coach etc. The function decoder’s adress can be programmed with the same value like the locomotive’s adress of the same train. As a result, the complete train is controlled together with the interior light (switchable with function key) via one single adress. The front- and backlight of the engineer’s cab wagon is switched together with the front- and backlight of the locomotive (light function key). Additional the interior lights are dimmable and flicker free. Switchable triple headlight and rear lights changing with the direction of travel (only function decoder for engineer’s cab wagon) via function key. Switchable interior lights via function key. The installation of a function decoder is as easy as the installation af a locomotive decoder. Please note that the function decoder can only fulfil its functions in a perfectly working wagon. If the wagon’s supply contacts to the rails don’t even work perfectly in the analog mode please fix these errors at first before installing the decoder. During the installation the wagon must be in a voltage free state. You just need a little screwdriver for the installation. As regards the installation, it is not necessary to solder, to mill or to break lines. You can set the wagon back to normal state at any time.